Build on What You Know You read in Lesson 1 that Constantine renamed the city of Byzantium Constantinople. That city became the capital of the Eastern Roman Empire. Because of the city's original name, historians call the Eastern Roman Empire the Byzantine Empire. Mosaic of Justinian - Justinian regained lost lands and briefly reunited the Eastern and Western Roman empires. He is considered one of the Byzantine Empire's most important emperors. ESSENTIAL QUESTION How did Justinian restore the Eastern Roman Empire? The Byzantine Empire continued for about 1,000 years after the fall of the Western Roman Empire. Like the emperors of the Western Roman Empire, the emperor of the Byzantine Empire was its absolute ruler. Also like the Western Roman Empire, the Byzantine emperors struggled to keep Germanic peoples, Huns, and others out of their lands. Despite their efforts, much Byzantine land was lost to invaders. One emperor was able to restore control over the former lands of the Eastern Roman Empire. 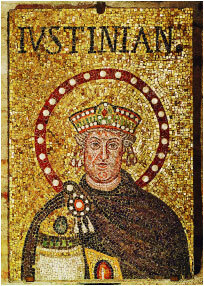 Justinian was emperor from A.D. 527 to 565. His armies reconquered lost territories, including Italy, northern Africa, and the southern coast of Spain. Hagia Sophia - Built by Justinian, Hagia Sophia was the greatest of all churches in Constantinople. Today it is a museum. Justinian also began to rebuild Constantinople, which had suffered much damage from a revolt. He rebuilt the city walls. He also built schools, hospitals, law courts, and churches. 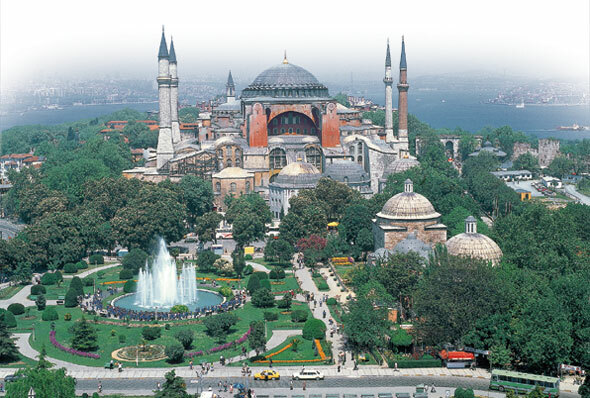 The most famous church was Hagia Sophia (HAY•ee•uh soh•FEE•uh). Constantinople was again a glorious city. Justinian appointed a committee to create a uniform code of law based on Roman law. These experts dropped outdated laws and rewrote others to make them clearer. The new code was called the Justinian Code. The code included laws on marriage, slavery, property ownership, women's rights, and criminal justice. Although they spoke Greek, Byzantines thought of themselves as part of the Roman cultural tradition. Byzantine students studied Latin and Greek, and Roman literature and history. In this way, the east preserved Greek and Roman culture. In the former Western Empire, the Germanic peoples blended Roman culture with their own. However, they lost much of the scientific and philosophical knowledge of the Greeks and Romans. Theodora was an empress of Byzantium—which was unusual, considering her background. Theodora was an actress, and Byzantine society looked down on actresses. Yet Justinian, the heir to the throne, married Theodora in A.D. 525. His choice was a good one. Justinian and Theodora became emperor and empress in 527. In 532, rioters threatened to overturn the government. Theodora urged Justinian not to flee. She herself refused to leave. Her courage inspired Justinian, and his generals put down the rebellion. Later, Theodora had laws passed that helped women. Divorced women gained more rights. She founded a home to care for poor girls. She also offered protection to religious minorities. Theodora's mosaic portrait may still be seen in the Church of San Vitale in Ravenna, Italy. ESSENTIAL QUESTION Why did the Christian church divide? The division of the empire also affected the Christian church. Religious practices developed differently in the Christian churches of the east and of the west. Cultural practices and limited contact between the two areas caused these differences. Another difference had to do with the authority of the emperor over church matters. In the east, the emperor had authority over the head of the church. In the west, there was no emperor and the pope began assuming more responsibilities in governing the former Western Empire. Problems between the two churches began to grow. The pope claimed authority over the churches in both eastern and western empires. In A.D. 1054, delegates of the pope attempted to remove the eastern head of the church. The eastern church responded by refusing to recognize the authority of the pope. Finally, the Christian church split in two. The church in the west became known as the Roman Catholic Church. Catholic means "universal." The church in the east became the Eastern Orthodox Church. Orthodox means "holding established beliefs." Over time, the split led to the development of two separate European civilizations. Each had its own view on the relationship between church and state. The pope claimed authority over Christian emperors and kings. This authority allowed the Roman Catholic Church to influence government in the lands that were once a part of the Western Roman Empire. Disagreements between the church and some kings and emperors of Western Europe would later cause major conflicts in European history. In the Byzantine Empire, the emperor was the absolute ruler. He had power over the church as well as the government. This meant that the emperor had power over the spiritual head of the Eastern Orthodox Church. Overall, the Byzantine emperor had greater power than the emperors or kings in the west. ESSENTIAL QUESTION What happened to the Byzantine Empire? For many years after the division of the Roman Empire, the Byzantine Empire continued to carry on Roman traditions. But it was not easy. The Byzantine Empire faced constant threats from both the east and the west. In the 600s, a new religion called Islam began in Arabia. Muslim armies arose and attacked nearby territories and Constantinople. Later, civil wars, as well as attacks by Ottoman Turks and Serbs, further weakened the empire. By 1350, all that remained of the Byzantine Empire was a tiny section of the Anatolian peninsula and a strip of land along the Black and Aegean seas. Finally in 1453, an army of Ottoman Turks captured Constantinople. The city's conquest marked the end of the Byzantine Empire—a thousand years after the fall of the Western Roman Empire. 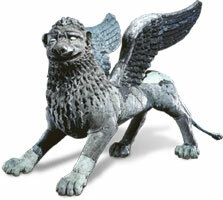 Lion of St. Mark - The winged lion stands guard near the Byzantine-style Cathedral of St. Mark located in Venice, Italy. Emperor Justinian regained much of the Roman Empire's land and helped preserve Roman law and culture. In 1054, the Christian church divided into the Roman Catholic and Eastern Orthodox churches. The pope of the Roman Catholic Church played a greater role in government in the west than the leader of the Eastern Orthodox Church played in the east. Today millions of people practice their faith as members of the Roman Catholic Church or the Eastern Orthodox Church.